After applying Mess Patch, super hero The Bigredhammer would have let out a "woot" of joy, if it hadn't been for his sleeping roommate. So he let out a mini-woot. I can't agree more with his closing words: "Thank goodness for Messers." >> The piece of goodness this compo was all about: Mess Patch for Windows Live Messenger. A recording of Tuesday's webcast with British Prime Minister, Tony Blair, is now available on MSN Video UK. A transcript of the Q & A session is also available here. Everything's been slightly edited, but it gives a good impression of the first ever (rather short) "Question Time" via the Video Conversation feature in MSN Messenger. I came across a couple of currently ongoing official MSN competitions, thought I'd share them with you because with some of them you can easily score free MSN Winks (and who knows something better). The Allo Messenger quiz, which first launched in France, has come to Belgium. If you're 18 years or older, you can win a pair of Logitech headsets by answering three simple questions (if you understand Dutch that is, otherwise try answer 3, 2 and finally 1). Chances are higher you'll grab one of the thousands of free Winks babbling "Hey, zet je headset op!" (that's "put on your headset" in Dutch) and then singing "Be-Bop-a-Lula". Closing date: May 4th 2006. Another competition which originated in France is Magic Search. It received a makeover for the United States as well as the Italian market. In the US, you can win gift cards, a cruise, a flat screen or even cash to give to your favorite charity organisations, by just searching for suggested terms and then clicking the sponsored ad. Open to 18 year olds and older only, until April 30th 2006. With the Italian version, if you try enough, you can win an Animoticon (nothing special, just Italian for Winks) of a three-eyed "diablo" with an evil laugh. Finally, and also in Belgium, there's are point 'n click detective game called Waar is Kitty? (translation: "Where is Kitty?") which requires the MSN Search Toolbar and has a weekend in Paris as main prize. Good luck finding the missing cat! UPDATE: anonymouse91 informed me that this game was first launched in the UK (and US) as The Kitty Caper. The original adventure is already over and so is the Italian one, but next to the Belgian version there's another in progress in Australia (Click here) where you can win AU$ 5000. If you are aware of any other official MSN or MSN Messenger-related competitions, let us know via this form. BTW: I'll announce the winner for our Mess Patch mini-competition tomorrow, so enter now before it's too late. To put an end to the flow of people reporting this in vain, I'm informing that the "leaked" Windows Live Messenger 8.0.0614 version going around on download sites, is in fact a fake build doctored by one of our forum members as an April Fools joke (1 and 4 stand for the first of the fourth month). Here's a good tip: never trust a build without an installer. Call v8.0.0614 a hoax, but it's also a good attempt at recreating the brand new Windows Live Messenger interface we previewed last week. Thumbs up to Monkey for the job. With the release of Messenger Plus! Live 4.00 set to the start of May, Patchou released the final version of its MSN/Windows Messenger 4, 5, 6 & 7-compatible predecessor: Messenger Plus!. Download version 3.63.148 to be fully prepared for the public release of both Windows Live Messenger and Messenger Plus! Live in a couple of weeks. MP! Live will automatically disable this version as soon as its installed, but you will be able to appeal to this version of the addon in case you're using Windows Messenger 4 or 5. >> Download Messenger Plus! v3.63.148. 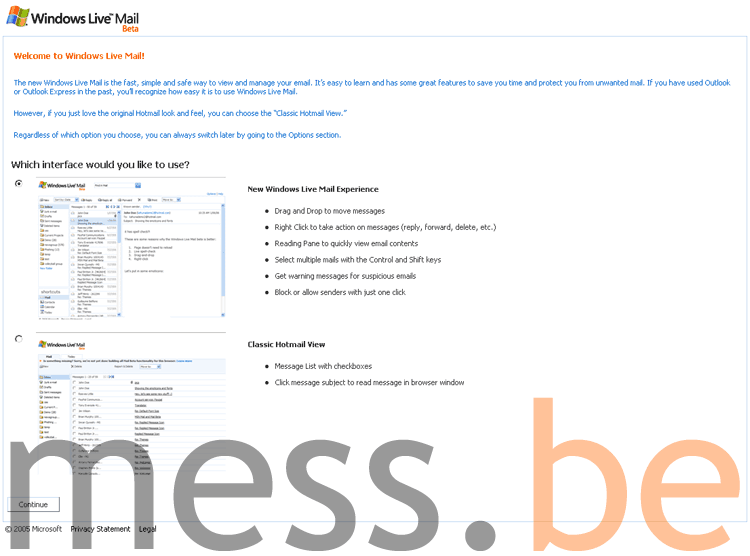 This morning I noticed Mail Beta sign-up buttons in two of my Hotmail accounts. Clicking them instantly transforms your account into the new style of Hotmail, now just Mail, previously Kahuna. Went through a short configuration selecting my preferred interface, layout (the Outlook style) and colors (orange! ), and *tada* I was in. Five minutes later, I was out again. Seems like the Windows Live Mail Beta completely refuses to search my inbox. Not so convenient when you have over thirteen thousand e-mails in there. That doesn't mean it won't work for you -after all, it's a Beta and it's already being used by more than one million people- so don't let my story withhold you from clicking that button when it appears. You can always opt-out again (Options > Your Account > Beta opt-out or log in and replace everything in the URL after /mail/ with options.aspx?subsection=9). Don't like waiting for the button to show up? 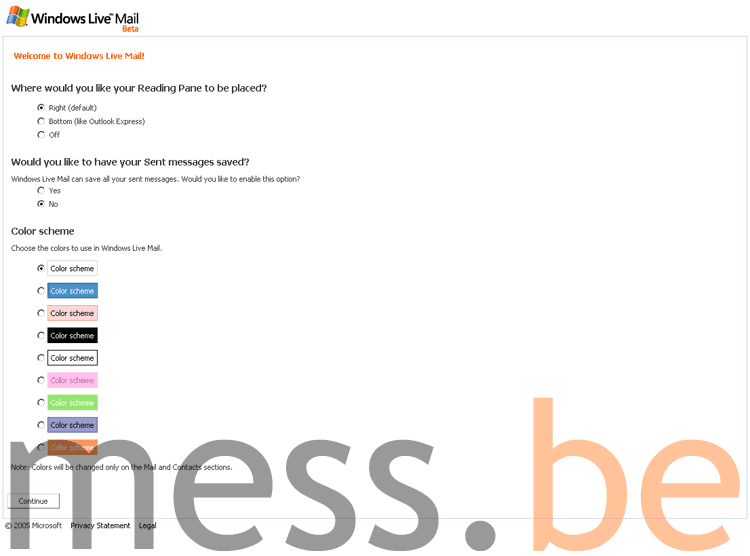 Then participate in our Windows Live Mail Beta Invitation thread or if you're really quick maybe you can grab this or this invite kindly offered by Rolando. An hour ago Tony Blair made himself available for his traditional Question Time through a rather untraditional medium: MSN Messenger. Like we previously announced, ten people from over the world were able to interrogate the British Prime Minister about the 'issue of Africa' and the 'issue of climate change' through a Video Conversation. I was recording it live but then the video feed went blank and I pushed several wrong buttons, so basically I lost it (*kicks himself in the face*). But if MSN is smart, and I'm sure they are, they will put the archived video online themselves (maybe here?). The video of the very first online Question Time combines regular camera footage as well as some screen capturing of MSN (not Windows Live) Messenger. Tony Blair did not mind a few technical difficulties and called it an "amazing" way to communicate with people. Blog about Mess Patch and win! When we released Mess Patch for Windows Live Messenger about two weeks ago, I also organised a little competition. This is the last call for entries and because not so many have participated yet, the chance to win the $50 Amazon.com gift certificate is still high! All I want you to do is post something about Mess Patch on your personal Space, blog or site and then let me know (send your link to competition messpatch.com). Hurry up! A winner will be picked at the end of the week. >> Wanna be messing something? Download Mess Patch for Windows Live Messenger. "It is extremely cool to be able to use instant messaging while driving. Currently the input is possible via a bluetooth keyboard, but we are working on voice recognition, since there are some security concerns when messaging while driving. Our next release will include a touchscreen layover for the windshield, so a driver can easily move the windows as needed. With the mabber HUD you will be able to get traffic information displayed directly to the screen, which we will push to the user with pubsub." Although this is a hoax (fortunately! ), Mabber does exist and is in fact a recently launched, web-based IM client that connects to the .NET Messenger Service, ICQ, AIM, Yahoo! and Jabber. If you want to give their beta-version a test-drive then ask info mabber.com for an invitation. We would never turn our back on MSN/Windows Live Messenger! April Fools!